Two levels of space, big screen TVs and a great outdoor patio make this a great place to watch the game or grab food & drinks. It's a bit of a walk from the gay hood, but we'll worth the trip. Watch from the big windows as boys and girls pull up on cabs by the dozen. Trivia night, grag bingo, drag brunch buffet, poker tournaments, summer movies on the roof. Fun little bar, go up stairs to enjoy the awesome weather with your mates. Went here by myself, I'm very shy but was asked very shortly after first beer, hi how are you? Beautiful day all big windows open upstairs. Great rooftop! Enjoyed my birthday party there. Staff was GREAT! Had a great time with some NYC visitors, including straight parents and their twin gay sons. Super service, nice eye candy. Overall fun, although it can be a tad on the young side upstairs. As soon as i sat down to eat the waiters acted as if they were doing me a favoe to serve me, later on even though I was having a good time and was very composed i was asked to leave because they said i drank too much which never happenned to me! I was embarrassed for no good reason. Also you call this a "sports bar"? Nobody was watching any sports. I huess it really is a Nelly place, I wasn't very happy. Go here all the time, always full, always friendly! The sports are here. But don't go alone. (revised Jan 2015) My hotel didn't have CSN so I couldn't see the Capitals game. 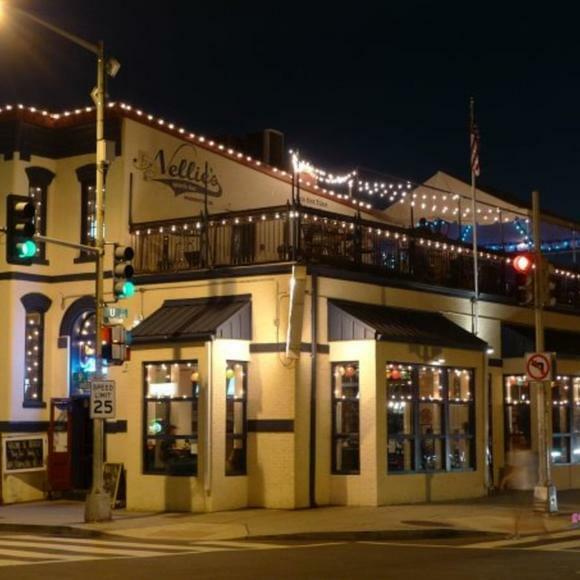 I went to Nellie's and, sure enough, it was on...as was every other sports event in the universe. (I think.) Lots of TVs so of course no sound...that seems the norm for modern sports bars. The staff is pleasant and they have their very own beer which is pretty good. But I didn't get to really interact with anyone; I think I was the only hockey fan there. This seems to be a bar people don't go to by themselves; everyone seemed to be with someone else.